Ryan Spanton, Regional Sales Manager with WesTech Engineering, talks about the company’s focus on customers as brand advocates and other trends for the water and wastewater industries. The following is an excerpt from a Q&A with Water Online Radio. Click on the Radio Player above to hear the full interview. Water Online Radio: Give us the ten-thousand-foot view of WesTech Engineering. What do you do? How do you serve your market? 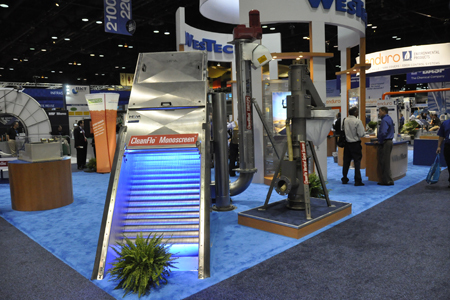 Ryan: WesTech has an extensive line card as manufacturers of water and wastewater treatment equipment. We offer a unique stem-to-stern solution for water and wastewater treatment plants, and we offer a variety of options in each area. WesTech has multiple solutions, whereas a lot of manufacturers have only one or two pieces of equipment that they work with or only focus on a certain process or a certain part of a plant. Based on the flow rate, water quality, and permit specs, we can offer the very best solution rather just one solution. We're unique in the expansiveness of our line. Water Online Radio: You mentioned that WesTech works and sells through independent sales reps, and those folks are right at ground zero, if you will. What are you hearing from them? Ryan: We start to hear that the domestic market's recovering and at the same time, it seems like we're moving away from larger plants and into smaller plants. We also see a trend toward international business. The international market has been big for WesTech, and we are looking to develop those markets more now than ever before, to ensure that we stay relevant in our marketplace. Water Online Radio: Are there any technological advances that we ought to be keeping an eye on? Ryan: Everybody's always looking for new technology to stay ahead of the game. WesTech has some newer products in the area of stormwater. We're also always looking to do tertiary treatment. Permits are getting tighter, so we're implementing technologies that address improved nutrient removal. Everybody's looking now towards desalinization as water becomes scarcer and available water becomes more polluted. WesTech is no different. We're looking for technologies that do this. Water Online Radio: Another trend we see a lot of in this industry is the consolidation of manufacturers. You see big companies acquiring smaller ones, or merging with other big ones. Not so with WesTech. You've got this employee ownership philosophy still in place. Talk about why that's valuable to your customers. Ryan: I think knowing that the provider of your equipment is going to be there week in, week out, month in, month out, year in, year out, is very important. It gives you that confidence in who you're working with. I think what it really means is when you get on the phone with somebody at WesTech, you're speaking to an employee owner. You're speaking to somebody who has a direct benefit from your business, from your customer satisfaction, and from the angle of having you be a good reference for us. That vested interest in the success of the project really shines through in how they respond. WesTech is a very service-oriented company. If we have a problem or a quality issue, we want to fix it. Having end users be very happy with our equipment is the most important thing to us, and it's key to our success. Water Online Radio: Talk about the trends with regards to regulatory oversight. How is that going to impact things going forward? Ryan: Obviously, the EPA has embraced nutrient removal. Following that, we're starting to see most plants pick up phosphorus and nitrogen limits for their discharge, at least for their wastewater plants. That's obviously going to drive a lot of what happens in the future. A lot of plants have already gone that direction. They saw it coming, so they pre-designed that into their overall flow process. Click on the Radio Player above to hear the full interview.